What is a Task Notification? A Task Notification is an email that is sent to the assigned resource when a task is assigned to them. Project tasks can be assigned to users or contacts. How do Task Notifications work? 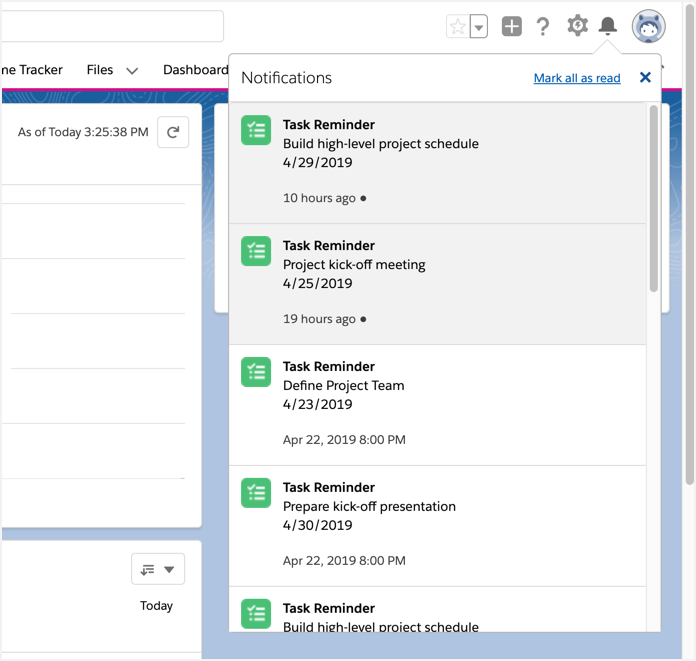 When Task notifications are enabled for a project, an email notification is automatically sent to the user or contact when they are assigned a project task. Assign a project task to a user/contact using the Assigned To column. Assigned user/contact receives a task notification via email. Please note that if you assign a task to yourself, you will not receive a task notification. You can enable or disable Task Notification for each project. When Task notification is enabled for a project, the users assigned to a project task automatically receive a task notification by email. To enable/disable task notifications, simply go to the project and click on the Project Settings Icon (Gear Icon on the Gantt Chart Toolbar). To enable Task notifications, check the box for 'Send task notification'. To disable Task notifications, deselect the checkbox. When you enable/disable task notifications, it is specific to the project you are working on. You can enable/disable task notifications for each project. Click on Apply to save your project settings. Please note that when you enable task notification for a project, it only enables task notifications to be sent to users who have been assigned tasks. 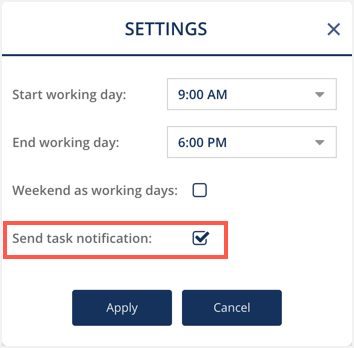 If you wish to also enable task notifications to be sent to contacts when they are assigned a task, then you would need to enable Contact Task Assignment Notification in the Inspire Planner Settings page. To enable Task Notifications for tasks assigned to contacts, you will need to go to the Inspire Planner Settings page. Go to the App Launcher at the top left corner. 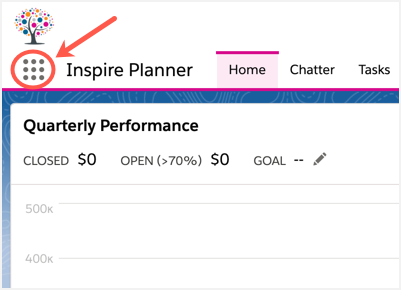 Enter 'Inspire Planner' in the Search Box and click on Inspire Planner Settings. Look for the setting called 'Enable Contact task assignment notification'. You can enable or disable the setting using the slide button to the right. Click on Save to save your settings. The table below provides a summary of how task notification settings in both the project and in Inspire Planner Settings affect task notifications being sent to users and contacts. When a user is assigned a project task, the user receives a task reminder on the Start Date of the Project Task. The Task reminder pops up on screen when the user logs into Salesforce. Please Note: Once you dismiss the Task reminder, it will not prompt again unless the Finish Date of the Project Task is updated. You can view all task reminders by clicking on the Notification icon at the top right corner of the screen. You can then click on a specific task to view it or you can mark all tasks as read.